I enjoy this web-site greatly. I think the Honda Elsinore is not only a fantastic series of bikes, all the way up through the CR series, but the CR125M and CR250M are to me the greatest motocross bikes for their time ever made. Here is my story and some various pictures of a somewhat rarely seen bike, the MT125R production roadracer. I have owned six different MT125Rs and currently own and race two. I started racing motocross in 1972, on a Hodaka. In 1973, the CR250M came out and what a fantastic advance it was. The power, color scheme, trickness was something else. I still remember Marty Tripes and Gary Jones riding the prototypes, and the first test in Dirt Bike. 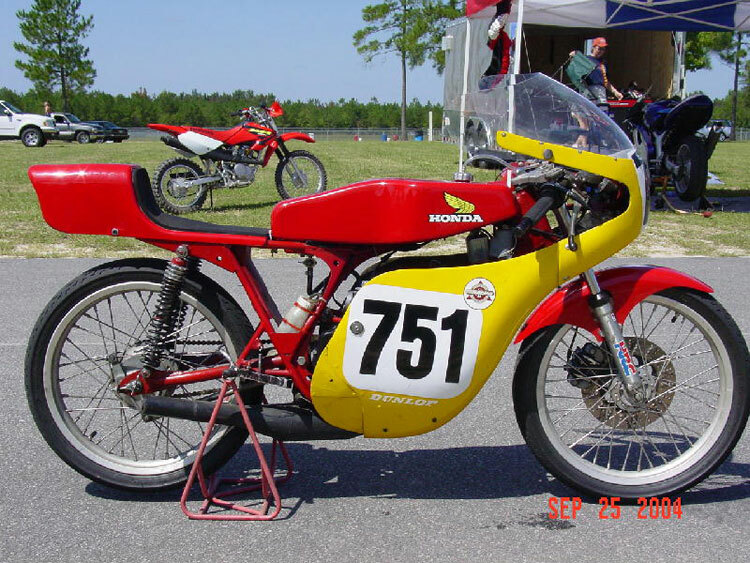 In 1974 I was 16 and my best friend Doug Evans came home with a brand new CR125M. I took one ride on that machine, and the performance was breathtaking. Light as a feather, and rocket power with 6 close ratio gears. I got my very first brand new motorcycle 4 months later, a brand new CR125M of my own. Coming home with that new bike is a day I fondly remember to this day. To make a long story short, I raced my CR125M for 2 years solid, all over Washington state. Later I moved up to 76 YZ125C mono-shock, 77 RM125B Suzuki (another fantastic bike) and on up to 250s, higher classes, and eventually some CR480Rs also. I raced up until 1986, when I moved to Georgia. During those years, I had quite a few race bikes, but none I held as fondly as that first CR125M. The highlight of those years was Doug and I making two trips to SoCal when I had my RM125, and he had a Husky 125 the first time, and Can-Am 175 the second time. Riding and racing the classic tracks of Indian Dunes, Ascot MX, Saddleback, and Racing World is a whole other story! Fast forward to 1991. I had kept racing modern MX, +30 class, but the "do or die" doubles got to be too much for me to keep risking, so I quit racing. I rode street bikes off and on for about 5 years, but the racing bug was still in me. In 1995 I learned about AHRMA vintage motocross and road racing. I joined AHRMA to learn more. Finally in 1998 there was a vintage road race at Road Atlanta. I went to check it out. Within 5 minutes of reaching the pits, my jaw was dropping seeing the very trick and pristine race bikes. Then a little bike caught my eye, and I walked over. I immediately recognized the Elsinore engine. The owner explained about the MT125R, I then remembered seeing them at the Honda shops in 1977-78. Each shop usually got one of them, they were sitting in the showroom in all white gel-coat fiberglass finish. Well, I searched for one, bound to try vintage road-racing, knowing how easy the engines were and mostly bulletproof. Finally, in 1998 I bought my first MT125R and my vintage adventure started. I took a road race school, then did two road races in 1999. In 2000 I went to AHRMA Bike week with two bikes, my first MT125R and a new (to me) 1970 Ossa Stiletto for my first vintage motocross attempt. Well, racing that MTR and my first experience on the banking at Daytona (I got 4th!!) was a thrill of a lifetime. Since then, the vintage bug is in full swing, I have quite a number of CRs from '73 to '83 models, bought and sold several MTRs, currently have two MT125Rs (one had the rare factory water-cooling option from 1978), a lot of Ossas and vintage and post-vintage bikes. I have been racing the AHRMA regional and national motocross series for 6 years, winning several championships. I race the MTR off and on, and also a modern RS125R road racer. Feel Free to e-mail me about anything vintage racing, the MTR, I love talking vintage racing! - Approx 200 imported into US each year. - Bike Dry weight 165lbs. - RSC offered a special factory water cooling kits in 1978, including pipe, cylinder., head, radiator, mounts, and special side cover with external water pump. - Water Cool kit avoided the heat-induced power loss form running at 13,500 rpm in a long race. - Top Speed (with a light rider!) approx 115 mph. - I have achieved 108mph at Daytona with 185lb rider.